There are many small towns in Louisiana perfect for retirement living. Some of the best small towns in Louisiana for retirement living are: Abbeville, Bossier City, Ferriday, Baton Rouge. Terrebonne Parish Jefferson Parish Louisiana. Located along the Cane River Lake, Natchitoches is considered a much smaller and calmer version of New Orleans. The town was settled in 1714 by the French and is the state’s oldest community. 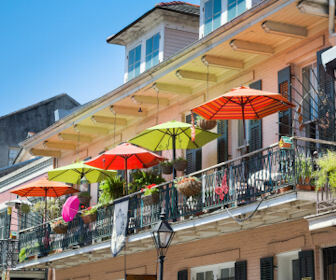 Cajun influences flow through the town and are apparent in the eclectic group of restaurants, cafes and shopping boutiques. White columns and Creole style make this town uniquely Louisiana. The biggest draw for White Castle is the Nottoway Plantation Resort found in the town. Tours of the plantation are available on foot or boat and visitors may opt to spend the night in one of the beautifully designed rooms. Portions of the historic plantation have been turned into a bed and breakfast like no other. The plantation is one of the few to survive the Civil War and is still considered to be the largest plantation home in the South. Located among the woods and thirty miles north of New Orleans, Abita Springs is home to the brewing company Abita Beer, which launched in 1986. Brewery tours are a big hit in Abita Springs and tourists travel from all over to frequent the facility. The area is a great place for visiting relatives during the holidays and makes for fun-filled festivities all year round. The town of New Roads is located along the Mississippi border in Pointe Coupee Parish. It is an attractive community offering numerous Creole and Southern dining options. Most of the homes are historic in nature and many of the hidden streets are tucked away from the buzz. Bed and breakfast lodging is found among some of the most beautiful homes in the town. New Roads is the place for antiquing, as shops line the downtown area. Frivolous and practical gifts can be found on nearly every corner. A beautiful and charming small town along the Gulf Coast is St. Francisville, Louisiana. Located along the Mississippi River, St. Francisville is a quaint little community that is popular among tourists and those of retirement age. The historic town has been restored and is an active participant in the Main Street Revitalization Program. Exquisite Ante-Bellum homes are scattered among the oak lined streets and grand plantations can be seen throughout the town. The plantations draw crowds during peak traveling seasons but the town never seems congested or over-crowded. The small and often referred to as “romantic” town of Coushatta is one of the best small towns in Louisiana. The area is known for its quiet and peaceful flow and romantic eateries. This is a great place for a day-trip or settling down to live out the golden years. 9. City of Covington LA The City of Covington, founded in 1813, is a charming Southern community nestled among three rivers. An eclectic mix of boutiques, art galleries, specialty shops and restaurants line the downtown streets. Special care has been taken to ensure the conservation of Covington’s historic homes and buildings while also allowing for the modernization of its infrastructure. The downtown historic district is home to many turn-of-the-century cottages surrounded by ancient oaks and South Louisiana’s lush, green foliage.City of Covington web site. Best Small Towns in Louisiana for Successful Aging from the Milken Institute Study include: Alexandria, Lafayette, Lake Charles, Monroe, Shreveport-Bossier City and Houma-Bayou Cane-Thibodaux LA. Indicators used in this study to pick the best Louisiana small towns for aging were general, healthcare, wellness, financial, living arrangements, employment, transportation and community engagement. England Oaks is an Active Adult 55 Plus Community offering single story duplex homes. Nestled in Zachary, LA and located in the award winning community of Copper Mill, sits what promises to be Louisiana’s Premier 55 Plus Active Adult Community. Live Oak Shreveport, Louisiana Live Oak offers independent living options for 55 plus active adults. These beautiful and comfortable apartments allow Live Oak residents the carefree lifestyle they deserve. Here at Village Maison each home is designed to provide the comfort and elegance you so richly deserve at this uniquely rewarding stage of life. Here you’ll enjoy the privilege of attentive service and upscale amenities of a resort. England Oaks is an Active Adult Community offering single story duplex homes. The homes are spacious 1008-1300 square foot accommodations with amenities. Alexandria, Baton Rouge, Houma-Bayou Cane-Thibodaux, Lafayette, Lake Charles, Monroe, New Orleans, Metairie, Kenner, Shreveport, Bossier City Louisiana retirment homes. Abbeville Abita Springs Addis Albany Alexandria Ama Amelia Amite City Anacoco Angie Arabi Arcadia, Arnaudville Ashland Athens Atlanta Avondale Baker Baldwin Ball Banks Springs Barataria Basile Baskin Bastrop Baton Rouge Bawcomville Bayou Blue Bayou Cane Bayou Country Club Bayou Gauche Bayou Goula Bayou L’Ourse Bayou Vista Belcher Belle Chasse Belle Rose Belmont Benton Bernice Berwick Bienville Blanchard Bogalusa Bonita Boothville Bordelonville Bossier City Bourg Boutte Boyce Branch Breaux Bridge Bridge City Broussard Brownfields Brownsville Brusly Bryceland Bunkie Buras Cade Calhoun Calvin Cameron Campti Cankton Carencro Carlyss Castor Catahoula Cecilia Center Point Central Chackbay Chalmette Charenton Chataignier Chatham Chauvin Cheneyville Choctaw Choudrant Church Point Claiborne Clarence Clarks Clayton Clinton Colfax Collinston Columbia Convent Converse Cotton Valley Cottonport Coushatta Covington Creola Crescent Crowley Cullen CutOff Delcambre Delhi Delta Denham Springs DeQuincy DeRidder DesAllemands Destrehan Deville Dixie Inn Dodson Donaldsonville Downsville Doyline Dry Prong Dubach Dubberly Dulac Duson East Hodge Eastwood Eden Isle Edgard Edgefield Egan Elizabeth Elmwood Elton Empire Epps Erath Eros Erwinville Estelle Estherwood Eunice Evergreen Farmerville Fenton Ferriday Fifth Ward Fisher Florien Folsom Fordoche Forest Forest Hill Fort Jesup Fort Polk North Fort Polk South Franklin Franklinton French Settlement Frierson Galliano Gardere Garyville Georgetown Gibsland Gilbert Gilliam Gillis Glencoe Glenmora Gloster Golden Meadow Goldonna Gonzales Grambling Gramercy Grand Cane Grand Coteau Grand Isle Grand Point Gray Grayson Greensburg Greenwood Gretna Grosse Tete Gueydan Hackberry Hahnville Hall Summit Hammond Harahan Harrisonburg Harvey Haughton Hayes Haynesville Heflin Henderson Hessmer Hester Hodge Homer Hornbeck Hosston Houma Ida Independence Inniswold Iota Iowa Jackson Jamestown Jean Lafitte Jeanerette Jefferson Jena Jennings Jonesboro Jonesville Jordan Hill Joyce Junction City Kaplan Keachi Kenner Kentwood Kilbourne Killian Killona Kinder Kraemer Krotz Springs Labadieville Lacassine Lacombe Lafayette Lafitte Lafourche Crossing Lake Arthur Lake Charles Lake Providence Lakeshore Lakeview Laplace Larose Lawtell Lecompte Leesville Lemannville Leonville Lillie Lisbon Livingston Livonia Lockport Lockport Heights Logansport Longstreet Longville Loreauville Lucky Luling Lutcher Lydia Madisonville Mamou Mandeville Mangham Mansfield Mansura Many Maringouin Marion Marksville Marrero Martin Mathews Maurice McNary Melville Mer Rouge Meraux Mermentau Merrydale Merryville Metairie Midway Milton Minden Minorca Monroe Montegut Monterey Montgomery Monticello Montpelier Montz Moonshine Mooringsport Moreauville Morgan City Morganza Morse Moss Bluff Mound Mount Lebanon Napoleonville Natalbany Natchez Natchitoches New Iberia New Llano New Orleans New Roads New Sarpy Newellton Noble Norco North Hodge North Vacherie Norwood Oak Grove Oak Hills Place Oak Ridge Oakdale Oberlin Oil City Old Jefferson Olla Opelousas Oretta Ossun Paincourtville Palmetto Paradis Parks Patterson Paulina Pearl River Pierre Part Pine Prairie Pineville Pioneer Pitkin Plain Dealing Plaquemine Plaucheville Pleasant Hill Pleasure Bend Point Place Pointe a la Hache Pollock Ponchatoula Port Allen Port Barre Port Sulphur Port Vincent Powhatan Poydras Prairieville Presquille Prien Prospect Provencal Quitman Raceland Rayne Rayville Red Chute Reddell Reeves Reserve Richmond Richwood Ridgecrest Ringgold River Ridge Roanoke Robeline Rock Hill Rodessa Romeville Rosedale Roseland Rosepine Ruston Saline Sarepta Schriever Scott Shenandoah Shongaloo Shreveport Sibley Sicily Island Sikes Simmesport Simpson Simsboro Singer Siracusaville Slaughter Slidell Sorrel Sorrento South Mansfield South Vacherie Spearsville Spokane Springfield Springhill St. Francisville St. Gabriel St. James St. Joseph St. Martinville St. Maurice St. Rose Stanley Starks Start Sterlington Stonewall Sugartown Sulphur Sun Sunset Supreme Swartz Taft Tallulah Tangipahoa Terrytown Thibodaux Tickfaw Timberlane Triumph Tullos Turkey Creek Union Urania Varnado Venice Ventress Vidalia Vienna Vienna Bend Village St. George Ville Platte Vinton Violet Vivian Waggaman Walker Wallace Wallace Ridge Washington Waterproof Watson Welcome Welsh West Monroe Westlake Westminster Westwego White Castle Wilson Winnfield Winnsboro Wisner Woodmere Woodworth Youngsville Zachary Zwolle, LA.